Ed Seward trained in Edinburgh before moving to Liverpool and finally North East London, obtaining a consultant post at Barts Health NHS Trust. 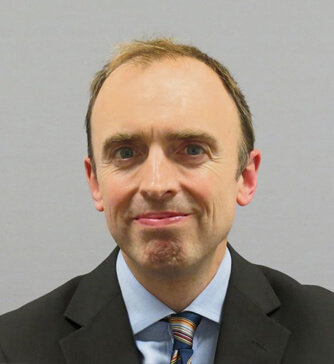 As Endoscopy Lead he developed a sub-specialist interest in therapeutic Endoscopy as well as pursuing a passion for service improvement and redesign, which culminated in his appointment as a National Clinical Advisor for Endoscopy. More recently, he has been responsible for piloting a pathway to shorten diagnostic waits in colorectal cancer which was shortlisted for a prestigious BMJ award, and has been taken up nationally by Cancer Research UK. Ed was appointed to UCLH in 2014 to deliver ‘Bowel Scope’ for the North central area of London – as well as supporting the interventional colonoscopy service and improving colorectal teaching and research. He specialises clinically in colonoscopy and large polyp removal, as well as working as London Vanguard’s Early Diagnosis Lead. He is currently collaborating to deliver a large trial of FIT in symptomatic patients (to assist early diagnosis of colorectal cancer), establishing a local endoscopy quality collaborative to improve efficiency within endoscopy departments, and a trial of colon capsule. He is also working to use Artificial Intelligence in polyp recognition and characterisation. He is trained in the innovative technology of full thickness resection in the colon, and is a recognised expert in the management of large polyps. Ed is a Fellow of the Royal College of Physicians, a member of the British and American Gastroenterology Societies, and provides expert advice for the NHS Ombudsman. He is also a senior lecturer at UCL, and lectures on the National Nurse Endoscopist Training Programme, and is responsible for endoscopy quality across the whole of North London.